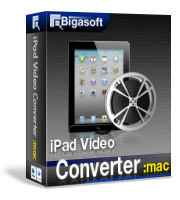 Bigasoft VOB to iPad Converter for Mac, the powerful Mac DVD iPad converter, is specially designed for DVD fans to take your favorite DVD movies on iPad Air, iPad mini, iPad, iPad 2, iPad 3 and the new iPad 4 for simplified entertainment on the go. It can convert VOB to iPad MP4 (MPEG-4), H.264 movies with high speed and amazingly sharp and detailed picture quality for high-quality DVD viewing on iPad as well as extract DVD audio tracks and save as iPad MP3 on Mac Lion, Snow Leopard, Tiger, and Leopard. The powerful Mac VOB to iPad Converter provides lots of editing functions and adjustable settings. You may preview the movie before conversion, capture your favorite scenes, convert DVD segment, crop black margin, automatically turn off after long conversion, merge chapters, select audio track and subtitle you preferred, adjust the parameters to customize output effect, and more. 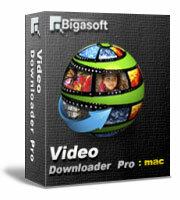 Just free download Bigasoft VOB to iPad Converter for Mac for unlimited high-quality DVD viewing on iPad right now. 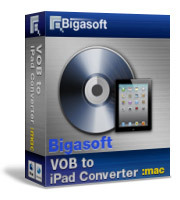 Ready to try or buy Bigasoft VOB to iPad Converter for Mac? The professional Mac DVD iPad converter helps to easily convert DVD movies including DVD5, DVD9, IFO, VOB, and more to iPad video MP4, H.264 with high speed and amazing quality. The powerful DVD iPad for Mac converter enables you to merge the selected chapters and titles into a single file. Lots of adjustable video and audio settings such as resolution, frame rate, video bit rate, audio bit rate, sample rate and more are provided by the smart converter helps to convert Mac DVD for iPad. The wonderful DVD iPad converter allows you to select target subtitle and audio track as you will. You can adjust the playing region of the DVD movies to fit for iPad with the wonderful VOB iPad converter Mac. 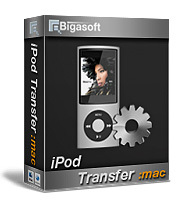 Bigasoft VOB to iPad converter for Mac is fully compatible with Mac OS X v10.4(Tiger), 10.5(Leopard), 10.6(Snow Leopard), 10.7(Lion), 10.8(Mountain Lion), and 10.9(Mavericks).